I recently found this quote and I just love it! It’s one of those ‘keepers’ that allows you to change the way you look at your life’s journey. 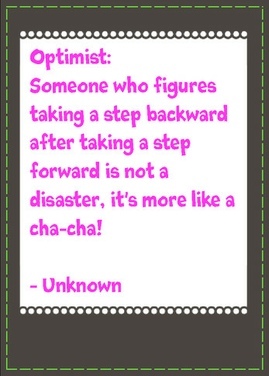 For me, I know mine is full of cha-cha steps! Woo Hoo ~ I just love to dance! So next time you feel like life is not all baby steps forward, just allow your Inner Hotshot a little cha cha and keep going! Dancing’s always a great spirit lifter! Cheers to the Cha Cha! My inner hotshot is dancing! Cha Cha Cha! I love dancing too! Great quote! I’m a total klutz and even I know this step! Been experimenting with being still and moving.The back step..interesting 🙂 I sure know about those.. And then there is this whole thing about other dimensions..that aren’t even forward or back.. So much to explore, truly. Dancing makes me happy. Hubby and I were quite the dancers in our day. As “elders” and/or “seniors”, Hubby shies away now. The joy of dancing was “rebirther” this summer when I took an Aqua Zumba class at the YMCA. Now, I have salsa, latin and hip hop music downloaded on my IPAD and we are blessed to have a pool as well as live in Florida, so I can practice my Aqua Zumba every day if I so desire. This “seasonedsistah” wants to keep on moving and enjoying life. Hmmm. Life as a cha-cha. Sounds like lots of fun!